I write to show who I am. The paper won’t judge me. I’m free to be who I am. Find Your Place: Volume 3 is hot off the presses! Last week’s Book Launch Party & Reading celebrated the Young Writers, a collection of teens who tenderly, fiercely, feverishly authored an 80-page book packed with poetry and prose. The party was packed with 50 people – including the mayor! – and love and support embraced the room. Young Writers is a program of Seashore Family Literacy, a nonprofit organization based in Waldport, Oregon. The group was formed six years ago by a dedicated handful and continues to grow each year. This year we have 13 students and six adult volunteer-mentors. The group is a voluntary activity. There are no grades, no attendance, no writing requirements. Just a lot of love, support and encouragement. 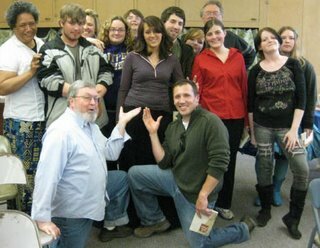 We meet every Thursday evening in the Writing Studio at the Waldport Community Learning Center. We share food, ideas, our latest work, and then we write together. And though much of the writing is dark and heavy, dealing with real-life issues, we spend a remarkable amount of time laughing. Somehow, when we’re in the Writing Studio, the burdens outside the room can be let go, if even just for two hours on a Thursday night. And sometimes, for many of us, those two hours mean the world. 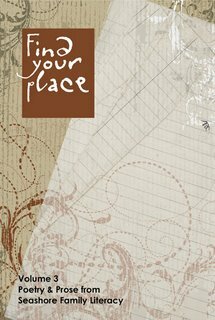 Find Your Place: Volume 3 is available for $10. Proceeds support the Young Writers at Seashore Family Literacy, a nonprofit organization.